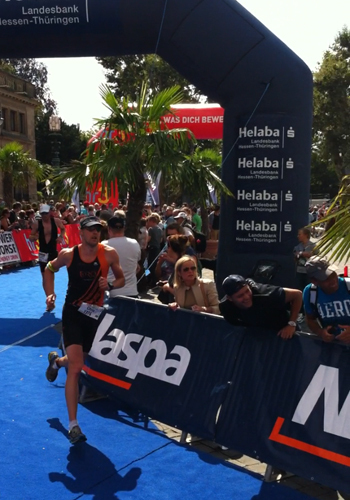 Chris Standridge: August 11th was the European 70.3 Champs in Wiesbaden, Germany. This was to be my 3rd and final half ironman of the year, picking out one of the toughest courses, but also the toughest competition so I could see how I would do against some of the best age groupers. The weeks leading up to the race I felt tired and lethargic, and I was starting to worry I had done too much racing over the last few months. What had started as a big goal race was turning into ‘a just get through it’ so I could concentrate my efforts back on London and the World Champs when I got back. We flew across on the Thursday night, giving me 2 days to rest up, register and get ready for Sunday’s race. Those 2 days really helped and by Sunday, those 3 lethargic weeks had been put to one side and I was ready to give the race my best effort. The swim was about 30k away from Wiesbaden, so an early start was needed to get on a coach to the race start. With 3000 competitors it was age group wave starts of approx. 3-400. I got a good start and quickly got into a good rhythm, in 3rd place. For the first 500m or so, I was working harder than I wanted to, trying to keep up with the lead swimmers, so I backed off slightly and swam the rest of the swim on my own. I had lost 30 secs or so, but came out the 1.9k in about 23:30. The 90k bike is one of the hardest on the 70.3 circuit, with about 4500ft of climbing. The course seems to be constantly going up or down with little time on the flat. The course rides the 30k back to Wiesbaden centre then a 60k loop into the hills to the north of the city. The plan was to hold a similar wattage to what I had done at Majorca in May (285 watts) as I had run well off the bike that day. In June I had averaged 300 watts at Bala and had found the run a real struggle, but had been a good test to see what I could handle. Today the power wasn’t coming easily, so I settled into a good pace which was solid, but I knew strong bikers would be riding up to me and then I could make a choice as to whether I could lift my pace or not. Early on, over the 1st hour or so I had about 10 cyclists come past me. I didn’t have it in the legs to go with them, but over the course of the bike I didn’t seem to fade either. After that nobody came past me, and I got to transition in about 12th place in my age group. I was worried on the run that I would have a similar lack lustre performance on what was a tough half marathon. It was a 4 lap course that is half a lap slightly uphill and then half a lap back down within a park. However, quite quickly I picked up a place or 2 and was feeling quite good. I held my pace well for approximately 10 miles or so and had worked up to 8th place. As is usual, the last 3-4 miles on the run is tough and very much a case of hanging on, which I managed to do to finish in 4hrs 30 mins. 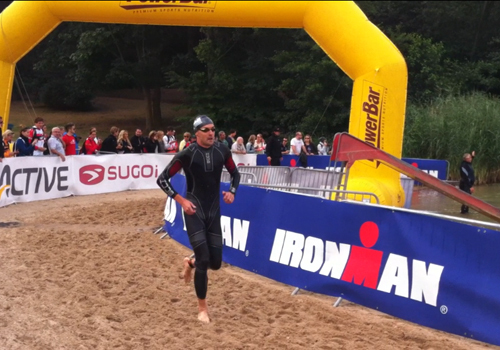 Despite being a bit off my best, I had competed well in what is one of the most competitive 70.3 races on the circuit. I had gained valuable experience in what I need to do to be at the top end of age group racing at this distance and raced a course that is likely to be a World Champs venue over the next few years (Ironman announced that the World Champs will be on a different course each year from 2014). I now have the London World Champs left, so back on to the speed, a weekend of racing at the National Relay Champs, then the middle of September is the season finale at the World Champs in Hyde Park. Looking forward to hopefully finishing the season on a high!